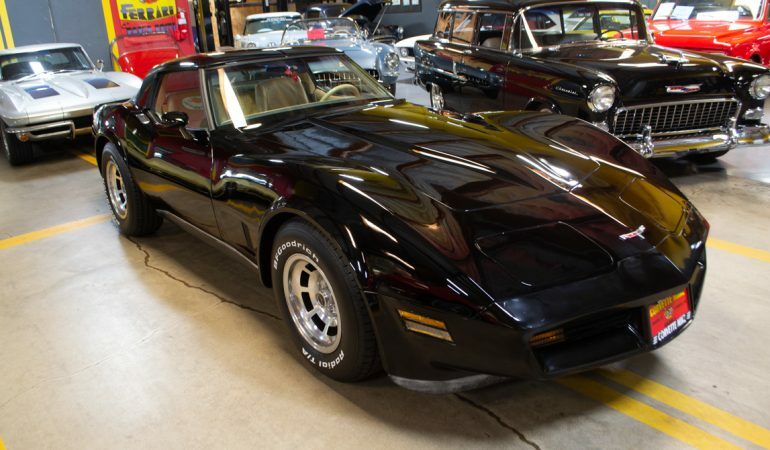 Featured Corvette: 1980 Black Corvette Coupe – One Owner – Only 14,000 Miles! 1980 Black Corvette Coupe with Doeskin interior, 350/190hp, 4-spd. manual transmission. The Black paint shines bright, the aluminum wheels look new and the interior looks almost like no one has ever sat in it! Doeskin interior with AC, tilt/tele steering column, leather seats, rear window defogger and am/fm stereo. Correct #’s Matching 350 Small Block, Rare 4-Speed manual transmission, Power Steering and Power Brakes. 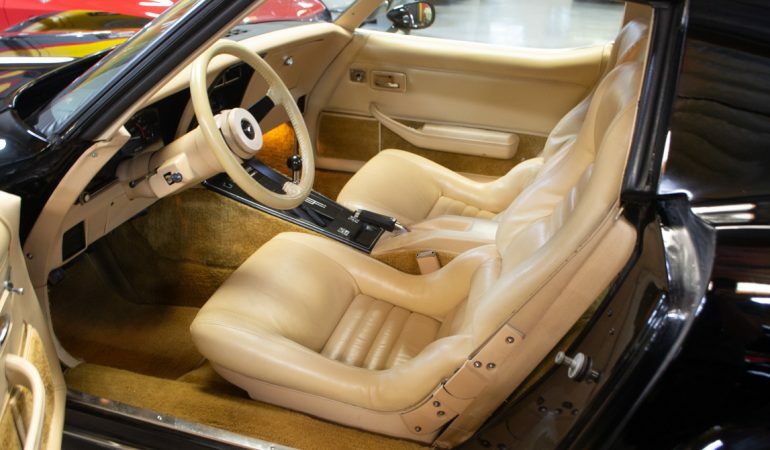 As most Corvette fans know, 1980 marked the final body revision of the C3 era cars. During its 14-year production run, the “Sharks” underwent no less than 5 of them!. There was ’68-’72, ’73 (being a transitional one year only body), ’74-’77, ’78-’79, and ’80-’82. Although some of these revisions were relatively minor, they were still distinct and brought Corvette forward, making it look fresh once again. The ’80-’82’s were especially handsome with their updated and extended front bumper. And rear bumper that incorporated an integrated spoiler, giving the cars a more raked appearance. It’s not often that we get in an early ’80’s C3 that has managed to survive basically untouched and in outstanding condition from new. So when we had the opportunity to grab this very sharp and very original, one owner, 14k mile ’80, we didn’t hesitate! The car was kept in excellent shape by its only owner. And when we got it, all it needed was a nice detail and it was ready to be shown! This example is not only original, it’s also rare in that it features a 4-spd. manual transmission. The Black paint shines bright and the interior looks almost like no one has ever sat in it! 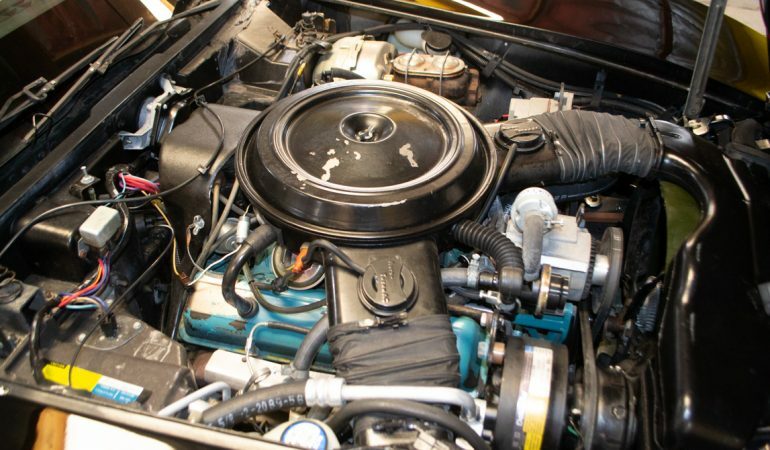 The original 350ci small-block starts right up and it goes down the road straight, shifts, handles and stops just as it should! This was the second to last year you could get a manual transmission as one was not available in ’82. Equipped with a-c, p/b, p/s, tilt/tele steering column and leather seats. Additional options include; aluminum wheels, rear window defogger and am/fm stereo.